Shout Out: End Year Sale is Coming ! Is it middle of December? If yes, you have to WAKE ME UP !!! Yes, December is a good month for you shopaholic. Start in the middle of December, Christmas, until New Year comes, many kinds of good stuff with good brand are offering special price. I beg you, MANY KIND. There are cloths, bags, shoes, cakes, furniture, foods, and many more. And it happen in everywhere, what a good news. 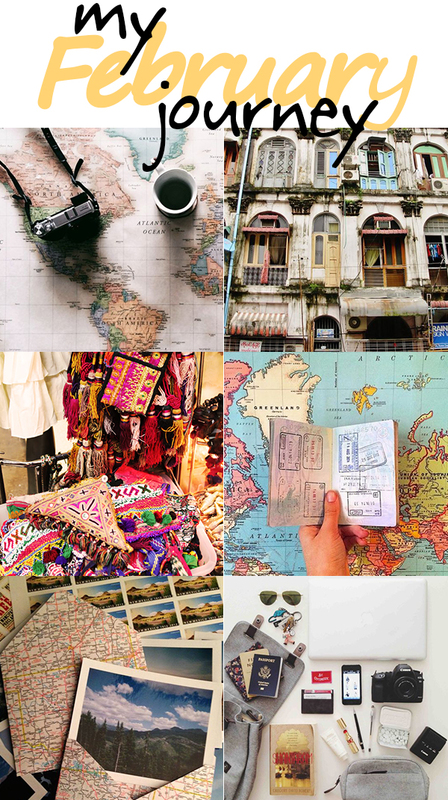 You can find it in Surabaya, Bandung, Jakarta, and blablabla city in Indonesia. Christmas Eve and New Year happen in the same time, right? I'm not a shopaholic, but I do love shopping very much. I'm glad to pay low price for some good stuff. I just can't describe the happiest-feeling-ever when I get a branded-limited-shoes-with-a-50-percent-discount-label-in-the-price-tag. The good feeling when you can have a pink backpack that cost only IDR 50K. Get everything and you just have to pay 70% from the actual price. I think everybody does love to have what they really want to have, of course without spend all their money. Here some good trusted brands that have discount for their items. 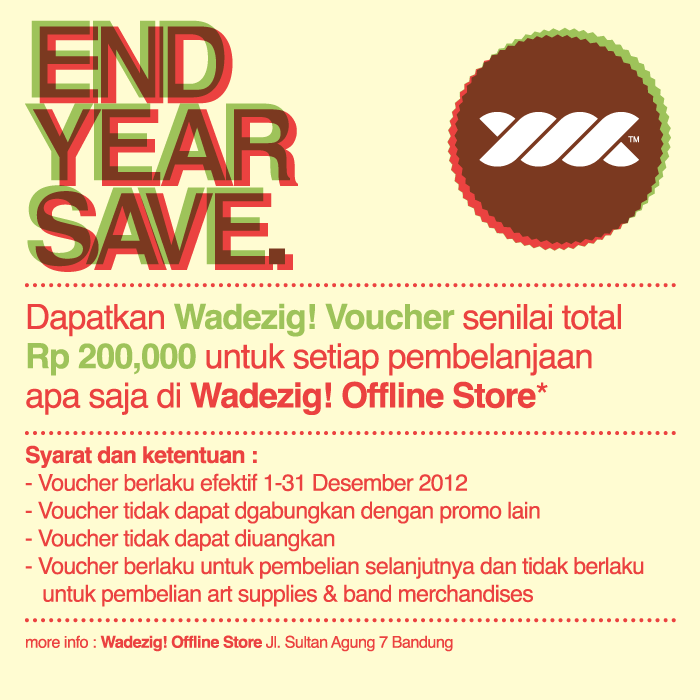 Glad to know that you're not too late to join in this end year sale. Check it out, guys ! It is an online shop from Bandung. They sold many kinds of girl's stuff, especially shoes. I mean really-really-really-adorable-shoes. But they also have limited bag, only one bag for one city. Awesome, right?. They have cloths, another good bag, and accessories. I'm one of their customer and I'm satisfied with everything that they have. I love their shoes. I love their good service. And I appreciate their kindness. Sssstt, I ever ordered a pair of boots, and they give me free shipping charges for some reasons hahaha. In this month, they have a promo. 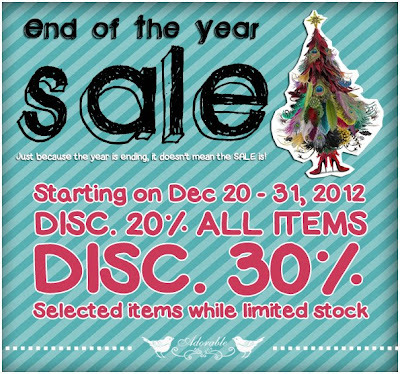 End of The Year Sale starting on December 20 - 31, 2012. Disc. 20% all items and Disc. 30% selected items while limited stock. They said, "Just because the year is ending, it doesn't mean the sale is!". So why think so long, just go to their website, and get some stuff fast ! Click here, Adorable Girl. For you guys who live in Surabaya, you have to be happy. Garlick Store have an event. It's called Estafet Sale. Starting on December 21 - 30, 2012. Do you wonder why it's called Estafet Sale?. Because it consist from several sale event. 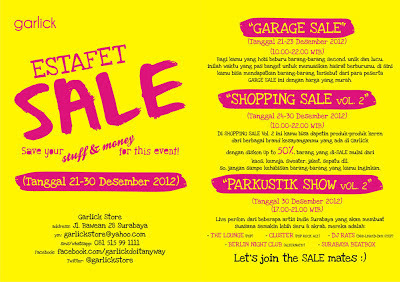 There are Garage Sale, Shopping Sale, and Parkustik Show. Last week, on Friday I went to Garlick Store with Rizka. The first day when the Estafet Sale started. We was looking for some good cloths in the Garage Sale. And yeah, we found it. I got a cute grey top and a chocolate stripe cropped tee. I pay IDR 40K for the top and IDR 20K for the cropped tee. Rizka got something too, and we love it. Unfortunately, I don't have the picture of the Estafet Sale because we was too busy to take a picture. And the place was so crowded. 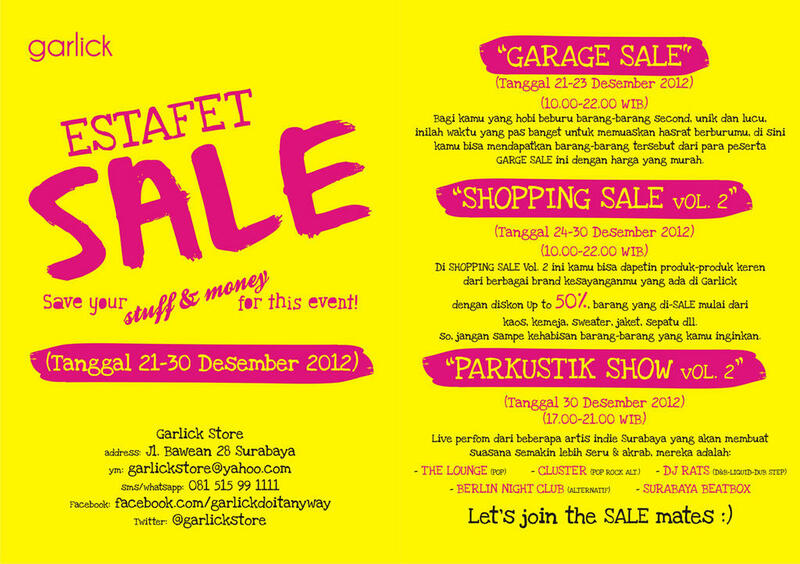 Maybe you can see the sneak peek of the Estafet Sale in Garlick Store's tweets, click here. Interested?. Curious?. Want to know? Just go ahead to Bawean Street 58, Surabaya ! This is one of my favorite brand. It also from Bandung. It has offline shop and online shop. The offline shop is located on Sultan Agung Street 7 Bandung and Ahmad Yani Street 38 Padang. You can find the online shop here. 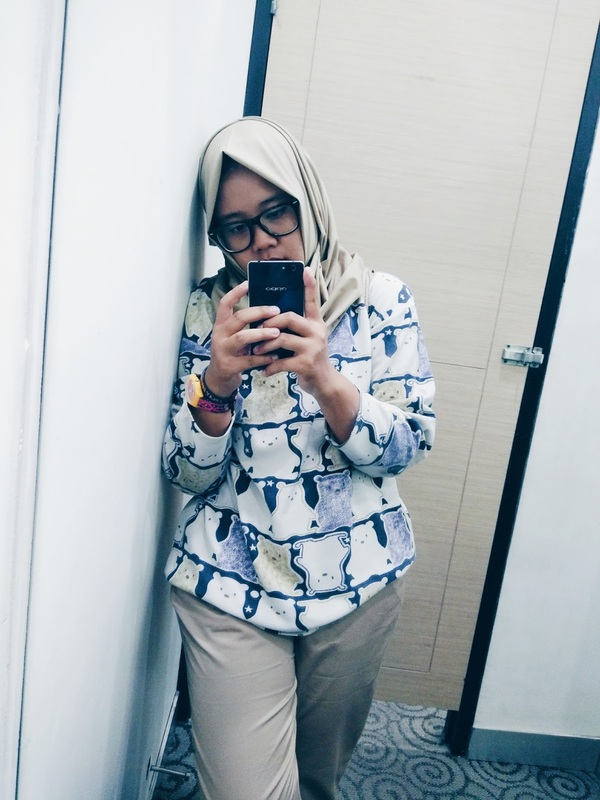 I love wear WADEZIG cause it has so many good design in their t-shirt and they are so update about teenage fashion in Indonesia. In this end year, they have a promo for you all who love to shop in WADEZIG. Check out the poster below this article. And you can also check the sneak peek of their product on their twitter. Happy Shopping ! And for the others, Happy New Year Eve, toroteoooooooott !